The Porch House is Lake|Flato Architects' fully-customizable solution for the prefab market. 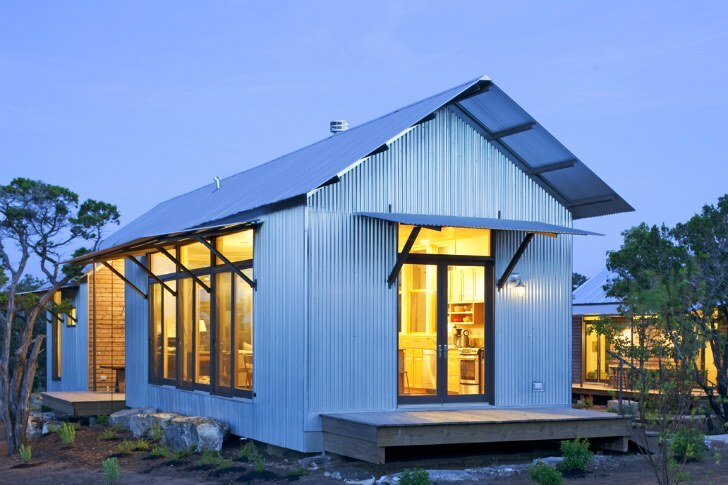 Designed for LEED certification and featuring passive solar design, natural ventilation and energy efficient strategies, the Porch House consists of a series of living and sleeping modules that can be strung together to create customized homes. 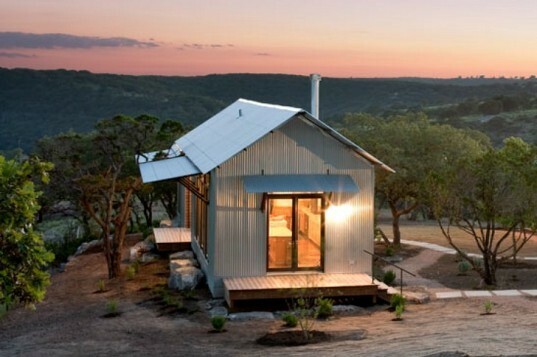 The prefab modules are connected by outdoor rooms, porches, and breezeways to create larger connected spaces, and solar panels can easily be integrated for net zero or off-grid applications. The Porch House is a fully customizable prefab housing system that is created by connecting different modules with “porches” that provide larger, more dynamic spaces. The outdoor elements include porches, breezeways, carports, and terraces. Lake|Flato has designed 9 different modules that vary in size from 28 to 46 ft long, and are of them are 17 ft wide. Units can be stacked on top of each other for a two-story building or left as a single story. Each module is designed and built to be energy-efficient, low-maintenance and extremely durable. The rooms also seek to maximize views, breezes, daylight, and water use through smart design and efficient appliances and fixtures. Large overhangs and awnings shade the interior from overheating, and cross ventilation provides low-energy cooling. Net zero or off-grid applications are easily achieved with the addition of roof-mounted photovoltaic systems. Modules are factory-built then transported to the site where they are set into place on a foundation or piers. Utilities, finishes, the roof, and any porch elements are then installed. Lake|Flato recently completed their first project, which consists of a series of cabin-like buildings with a few porches in between. The porch/module combo allows clients to mix and match for customizable homes and projects. Estimated time from the design to the move-in of a Porch House is 6 to 9 months. The Porch House is a fully customizable prefab housing system that is created by connecting different modules with "porches" that provide larger, more dynamic spaces. The outdoor elements include porches, breezeways, carports, and terraces. Lake|Flato has designed 9 different modules that vary in size from 28 to 46 ft long, and all of them are 17 ft wide. Units can be stacked on top of each other for a two-story building or left as a single story. Each module is designed and built to be energy-efficient, low-maintenance and extremely durable. The rooms also seek to maximize views, breezes, daylight, and water use through smart design and efficient appliances and fixtures. Large overhangs and awnings shade the interior from overheating, and cross ventilation provides low-energy cooling. Net zero or off-grid applications are easily achieved with the addition of roof-mounted photovoltaic systems. Modules are factory-built then transported to the site where they are set into place on a foundation or piers. Utilities, finishes, the roof, and any porch elements are then installed. Lake|Flato recently completed their first project, which consists of a series of cabin-like buildings with a few porches in-between. The porch/module combo allows clients to mix and match for customizable homes and projects. Estimated time from the design phase to the move-in date of a Porch House is 6 to 9 months. Lake|Flato's first completed Porch House project.